Easy Dinner: Slow-Roasted Moroccan Leg of Lamb, Weekly Menu Plan. This is the best leg of lamb I have ever made - or eaten. It's roasted slowly and gets very tender. With the potatoes roasted with the lamb this Easter Dinner is very little work. 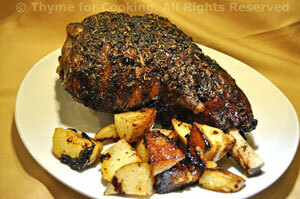 If you want a faster-cooking Leg of Lamb try Lamb with Garlic or Lamb on Potatoes. Normally, I just do this with fresh, snipped chives, but, as long as I had the green garlic, why not? Use chives if you don't have it. 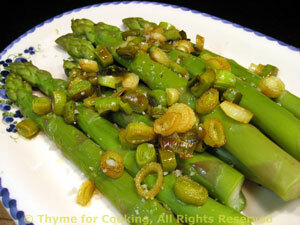 Be careful not to cook the asparagus too long, it should be just tender when pierced with a knife. Lay asparagus flat to peel, as it tend to snap easily. If your asparagus is very thick or it’s white use vegetable peeler and peel the bottom half of stalk. Lower heat and cook just until done, 8 - 12 minutes, longer for white, adding a bit of water as needed. When done drain and put into a serving dish. Trim green garlic, slicing off the root and removing 1 layer. Thinly slice as much as you can, including the green tops. Sauté 30 seconds and add asparagus. Sauté until heated through, put back onto serving dish and serve - adding salt and pepper if desired.